Into the Spider-Verse stands apart not only from other comic book movies, but from other Spider-Man movies. There's no shortage of superhero movies populating our big screens. But you know what we're lacking? Comic book movies. Sure, those superhero films are based on comic books, but they don't actually feel like the immersive artistic experience of reading a great comic book. They're mostly action comedies with superpowers. Spider-Man: Into the Spider-Verse is unmistakably a comic book film every step of the way. By embracing that aspect fully — and with a mocking sensibility — it's an absolute blast. Developed by Phil Lord and Christopher Miller (The Lego Movie), Spider-Verse taps into their brand of irreverent, self-aware humor while maintaining a heartfelt emotional core. When Spider-Man is first introduced via his own monologue directed at the viewer, this Peter Parker fourth-wall breaking acknowledges that we all know his basic story while walking through some beats of the Toby Maguire-led trilogy (including the cringey Spider-Man 3 dancing). But this movie is not about Peter Parker. It's about Miles Morales (voiced by Shameik Moore), an Afro-Latino teen. After getting bit by a superpower-inducing spider of his own, Miles stumbles across Spider-Man trying to stop the villain Kingpin from using a particle collider that could destroy the universe. The two connect briefly over their shared Spider-Sense, with Parker explaining the world-ending possibilities of the machine and promising training, but during the battle he is shoved into the particle beam, events spin out of control and that training session never happens. But the time in the beam has consequences, as Spider-Man equivalents from alternate dimensions — most notably the down-and-out, flabby, divorced Parker from The Amazing Spider-Man comics series — get sucked into this reality, eventually aiding Miles as he tries to figure out his own powers while trying to stop Kingpin and return to their own dimensions. 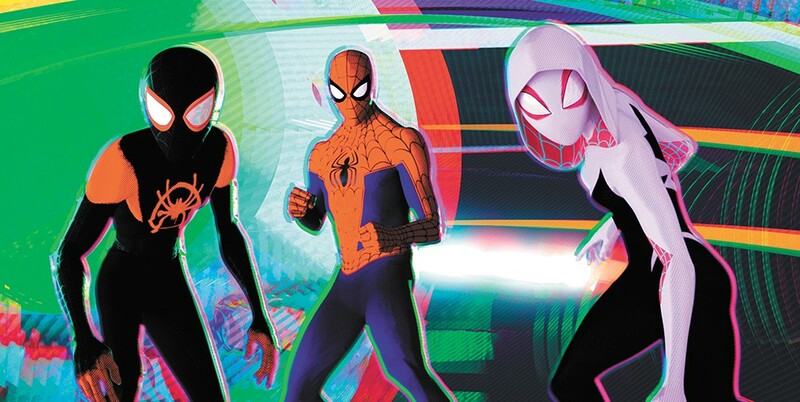 Spider-Verse's animation style stands apart from anything that's come before. It's CGI, but done in a way where frames look like 2D comic drawings. A combination of the line work and Ben-Day printing process dots (think '50s and '60s comics) instantly reads and fully immerses viewers in a comic book world. There are also wonderfully clever touches, like how comic text boxes start popping up only after Miles gets his powers. Directors Bob Persichetti, Peter Ramsey and Rodney Rothman nail the aesthetic. All the eye candy would be for naught if Lord and Rothman's script was off, but they clearly have an abundance of nerdy love for the various web slingers, and that allows the complex story to have character depth while maintaining a consistent comedic tone. The introduction of Miles as he poorly sings along to music on his headphones instantly endears him to the audience, and there's sincerity in moments like the one where Miles goes to buy a kid's Spider-Man costume because he needs one with these new powers. On the other side of childish wonder is the Amazing Spider-Man (Jake Johnson), who becomes Miles' de facto mentor and is refreshing thanks to his worn-out attitude. The enchanting sass of Spider-Gwen (Hailee Steinfeld) enters the picture before too long, a strong female presence with a graceful coolness that neither of her male counterparts can touch. The film manages to excel at referential pop-culture humor (the post-credits scene is gut-laugh fan service), physical comedy and most everything in between. The joke potential gets ramped up even further as more Spideys appear — the anime mech girl SP//dr (Kimiko Glenn), the Warner Brothers-esque cartoony Spider-Pig (John Mulaney! ), the hard-boiled black-and-white Spider-Noir (Nicolas Cage!!) — all of whom have their own distinctive animation style and unique sound FX, reflecting that they're pulled from different comics. The original print version of this article was headlined "Comic Relief"
Spider-Man: Into the Spider-Verse and Spider-Man: Into the Spider-Verse 3D are not showing in any theaters in the area.